It’s similar to menopause, but there are some important differences. People who get periods sometimes joke about menopause — it can’t come soon enough, etc, but the reality is that it actually can show up too soon. Premature ovarian failure (POF), otherwise known as premature menopause and primary ovarian insufficiency, is a condition in which your ovaries stop producing normal amount of estrogen, as well as releasing eggs, before you turn 40. Average onset is 27. Menopause happens when your body naturally stops making estrogen and progesterone and you eventually stop ovulating. Clinically, menopause is characterized by the absence of a menstrual period for 12 months. According to the Mayo Clinic, the average age for a person to enter menopause is 51, but you can also go through it in your 40s. The onset of menopause can be earlier if you’ve had a hysterectomy or have gone through chemotherapy or radiation. While everyone’s body is different, menopause can be accompanied by some truly annoying symptoms, like trouble sleeping, hot flashes,vaginal dryness and mood swings. The symptoms of POF resemble menopause, but they aren’t totally similar. It’s also kind of inaccurate to call it premature menopause, since menopause is when your periods cease and you can’t get pregnant anymore, and in premature ovarian failure, your periods might be irregular or you might skip them, but it doesn’t mean pregnancy is out of the question. Please remember that there are so many reasons your period could be late that have nothing to do with POF or being pregnant – stress, change in diet, exercise or schedule can also make your period late or absent. You should see a doctor when your period has been hiding out for three months or more. Diagnosing POF involves a physical exam as well as a pelvic exam and your doctor might also test for pregnancy to assess your levels of estradiol and follicle stimulating hormone (FSH), which helps release eggs. POF is rare – one percent of people who get periods have it, and in some cases, the cause is unknown. Other reasons it could happen include chromosomal abnormalities, like mosaic Turner’s Syndrome (that’s when you have one normal x chromosome and one that’s slightly altered), or Fragile X syndrome, which is marked by anxiety, intellectual delays, hyperactivity, and seizures. If you have an autoimmune disorder, you could also have POF, especially if your pituitary gland is compromised, since it’s from there that the hormones impacting ovulation are released. According to the National Institutes of Health, 40% of cases of POF are genetic, yet another reason to ask your mother and grandmothers about their health history, especially when it relates to menstruation. Megan Zander was diagnosed with POF in her early 30s. “Now that I was finally ready to start a family I was slapped with the reality that my best chance for getting pregnant passed me by when I was still in high school,” she wrote in an essay for Romper. Taking birth control pills is a key part of navigating her symptoms, as is exercise and diet. Because menopause can increase the likelihood of heart issues, paying attention to diet is extra important. POF can’t be reversed, but it can be treated with estrogen therapy, as well as calcium and Vitamin D supplements (to reduce your risk of osteoporosis). 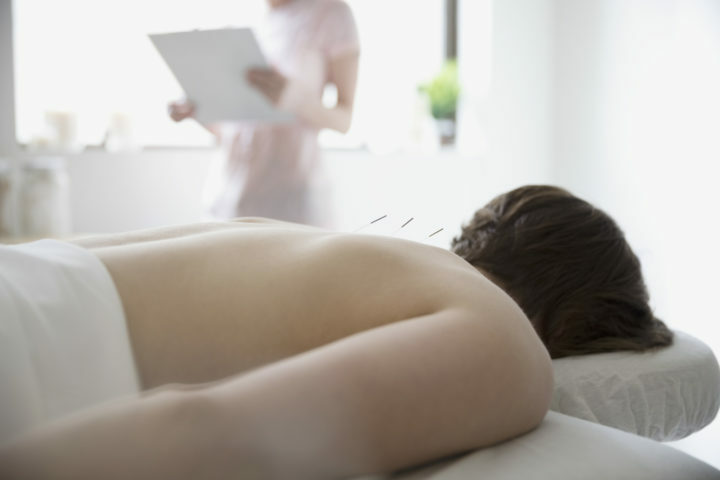 “Studies have proven that acupuncture is extraordinarily effective for the treatment of premature ovarian failure by improving hormone levels of FSH and estrogen production,” says Licensed Acupuncturist and Master of Science in Traditional Oriental Medicine Kristen N. Burris of Eagle Acupuncture. If you are diagnosed with POF, it’s not a reason to give up on having kids. Again, it’s different from menopause in that respect – your ovulation doesn’t entirely disappear, and you might have some eggs hanging around, which is one reason why some doctors prefer to call it primary ovarian insufficiency instead of premature ovarian failure. It’s not unheard of for folks with POF to get pregnant – estrogen therapy can be helpful – but it can also be a very intense barrier to conceiving . IVF is one strategy you may want to consider, and there’s also egg freezing, if you do have eggs still available, although POF also influences the quality of existing eggs. If you don’t, donor eggs might be a good option. The Advanced Fertility Center of Chicago claims a 75% success rate for pregnancy for folks with POF if donor eggs are used in the IVF process.